On Episode 149 of CrossFit Radio, host Justin Judkins interviewed Greg Amundson, creator of the Greg Amundson CrossFit Goal Setting Seminar. Also featured on the show was Zach Even-Esh, who is an affiliate owner in New Jersey. This episode was webcast live at 6 p.m. PDT on Wednesday, Dec. 8, 2010. 1:25 Justin gave a product review of Samson Rings made by CrossFit affiliate owner Nick Massie. 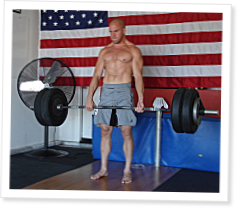 6:30 Original firebreather Greg Amundson started training with Greg Glassman in the early days of CrossFit and has used his experiences since that time to create the powerful Greg Amundson CrossFit Goal Setting Seminar. Greg came on the show to explain how a CrossFitter would benefit from the seminar, and he defined what a goal actually is. By following the steps he outlines in his seminar, Greg believes one will see improvements in his or her performance. Greg also talked about how the knowledge gained from the seminar will carry over into other aspects of a CrossFitter’s life. 38:10 Justin issued a WOD challenge where the winner will receive a CrossFit Radio T-shirt. 40:50 Zach Even-Esh has built his affiliate, Underground Strength Gym, around training high-school and college athletes. He specializes in wrestlers but has had success with athletes from a variety of sports. Zach came on the show to talk about the difference between programming for athletes who are in season vs. those who are in their off season. Zach described how important general physical preparedness is to athletes, and he explained how having young athletes specialize can actually be detrimental to their progress in the long run. JJ - thanks for the opportunity. It is very honorable and humbling to share the air waves with Greg, as we have ALL looked up to him since day one. I hope people take the time to listen to this episode, no doubt it is POWERFUL shizzaaaa!! !